Novices from the Philippines, Europe and New Zealand became Marists during Mass at San Nicolas Chapel, Davao on the feast of the Annunciation. John Guo Wang, Niňo Memorial and Roque Rebito (Philippines), Daniel Fernandez and Thilo Saft (Europe), and Philip Bennenbroek (New Zealand), made their vows as Marists. Described as a “joyful occasion” it was was presided over by Fr Larry Sabud, the district superior of the Philippines district. He was assisted by Frs Joaquin Fernandez (Europe) and our own provincial, Brian Cummings, each of whom received the vows of their respective novices. About 200 people took part in the profession ceremony and joined together after wards for a meal and to further the celebrations. 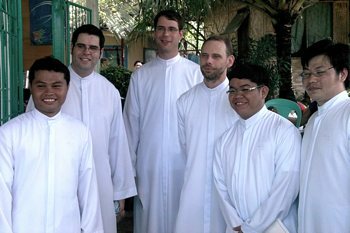 After eighteen months in the Philippines, the six new Marists will soon head back to their respective countries to continue their formation as Marist priests.